Induction heating is the preferred solution for tube and pipe manufacturers looking for more effective, cost-efficient heating technology. Whether you are involved in hot bending, weld stress relieving, heat treating, and coating or brazing, induction heating may be the ideal approach for your operation. 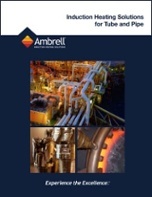 Fill out the form to the right to read much more about the benefits induction heating brings to these tube and pipe heating processes in our 12 page brochure! We respect your privacy, and will only use the information you provide to administer your account and to deliver the materials you requested. By clicking 'Get Requested Document', you consent to allow us to store and process the personal information you provide to deliver the content you've requested.